Sunday, noon to 10 p.m.; Monday and Tuesday, 11:30 a.m. to 10 p.m.; Wednesday, 11:30 a.m. to 11 p.m.; Thursday to Saturday, 11:30 a.m. to midnight. Signs that a restaurant qualifies as hip: The walls are brick. The floors are wood. The ceiling is tin. And the noise level is earsplitting. You'll usually find a blackboard that lists all manner of craft brews. And a menu that focuses on one specialty. At the new New York Burger Bar, it's not hard to figure out what that specialty is. You'll almost certainly do well with a simple Cheddar burger -- juicy, crusty and done to order -- in this case, precisely medium-rare. A modern classic, the "Juicy Lucy" comes stuffed with American cheese, topped with grilled red onion, tomato, pickle and a pink mayonnaise-based sauce. It's a gloppy treat. But overcooking mars both the "Eddie the Greek" lamb burger (with pickled red onion, feta, spinach and olive tapenade) and the "Manhattan" burger made with American Kobe beef and topped with pickled cucumber, red onion and a spicy Korean sauce. A server acknowledges the problem, whisks the burgers away and later returns with properly cooked -- and much better -- versions. 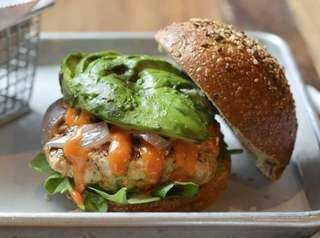 Both the house-made salmon burger and turkey burger succeed, thanks to chef Louis Mitrovich's judicious seasoning. Thick challah buns, however, need to be downsized. A non-burger hit: a blackened chicken sandwich featuring Mexican cheese and fried onion. For side dishes, opt for the sprightly coleslaw or fine hand-cut fries. Request dessert without aerosol whipped cream, which is unworthy of the Haagen-Dazs ice cream featured here in the restaurant's excellent chocolate milkshake. A scoop of vanilla crowns a moist chocolate brownie, an old-fashioned treat that's always right on trend.